The fifth release in the “TwoFlower” series of the VLC media player is ready. Version 2.0.4 is said to be “a major update that fixes a lot of regressions, issues and security issues in this branch. It introduces Opus support, improves Youtube, Vimeo streams and Blu-Ray dics support. It also fixes many issues in playback, notably on Ogg and MKV playback and audio device selections and a hundred of other bugs.” – quoting the VideoLAN news page. You can find some additional information on the release notes page. There I saw the new “ogg opus” support mentioned for the first time. OggOpus is a low-latency audio codec optimized for both voice and general-purpose audio. This was new to me so it did not get added to this set of Slackware VLC packages. I promise I will see if I can include it in my next set of packages. The new release also has fixed the playback of Youtube videos. Google changes its Youtube access protocol regularly, probably in an attempt to frustrate non-official ways of watching their videos. Luckily the Youtube video support is implemented as a Lua script so even for the older VLC 2.0.3 package, I was able to fix it without much effort a few weeks ago by downloading an updated youtube.lua file from the source code repository. Again, it took quite a while to get a new version of VLC stamped and the sources released to the public. Judging from the discussions on IRC, the developer team seem to have a fundamental internal disagreement about how to set goals for a release. It is obvious (if you read between the lines of the release notes) that the focus of the development effort between 2.0.3 and 2.0.4 has been on the Windows and Mac platforms with additional focus on the new Android platform (did you try the Android app yet? I like it). This does not mean that there is nothing new to report for the Linux users. The number of general improvements is equally impressive. There is also talk of “security fixes” but so far I was not able to find a CVE reference. I have been making preparations for the compilation of new VLC packages a while ago. Remember that I have to create 8 VLC packages when VideoLAN developers release a new version of their player (two Slackware releases, two architectures per release, and then restricted/unrestricted versions of each) so I use tarballs of pre-compiled “contribs” binaries to speed up the process. 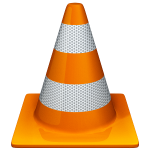 The contribs (which is how VideoLAN calls them) are actually the set of supporting libraries which provide the real functionality in VLC – playback, encoding, hardware support, etc. I compiled a set of these contribs two weeks ago for Slackware 14, and more than a month ago for Slackware 13.37. Several of those internal supporting libraries were updated with regard to my previous vlc-2.0.3 packages: Shout, aacenc, amrwbenc, amr, lua, upnp, v4l, x264; and for Slackware 14.0 I added two more: ffmpeg and live555. A further update to the vlc.SlackBuild (only relevant should you attempt to rebuild VLC from source) is the fact that it no longer needs to compile and use an internal Mozilla SDK. Slackware’s own seamonkey package in 14.0 (and the version of seamonkey for Slackware 13.37 which you can install from its/patches/packages directory) is now capable of compiling the Mozilla-compatible webbrowser plugin package “npapi-vlc”. Not having to compile the Mozilla SDK speeds up the total build time a lot. One remark about npapi-vlc: I still use the 2.0.0 release tarball since that is the most recent one that you can download. However, a version 2.0.2 was tagged in the source repository a few months ago. It’s just that the developer did not create an official tarball for that, and therefore I stick to the older version. The release notes speak of improved BluRay support in this release. Note that the BluRay support in VLC (at least in my package) works only for unencrypted disks… and I do not think these exist actually. But extracted unencrypted BluRay files on your hard drive should playback just fine. Playback of encrypted BluRay DVD’s requires that you also install my libaacs package: http://slackware.com/~alien/slackbuilds/libaacs or http://taper.alienbase.nl/mirrors/people/alien/slackbuilds/libaacs/) and find yourself a set of AACS decryption keys (see these comments for some hints on that). Posted: 18 October, 2012 in Slackware, Software. I sincerely hope for Opus support in as many audio players and en-/decoders as possible. The codec was developed for voice communication, but I have read reviews raving about its audio quality. It seems, the ever-lasting dispute, if Ogg Vorbis or MP3 or AAC is the best format to carry music around, could come to an end with Opus. It doesn’t cut high frequencies as rude as AAC, which provides otherwise more natural sound at low to medium frequencies compared to MP3, and it seems to cause less load on the CPU while decompressing than Ogg Vorbis. So, I am really looking forward to support for this new format in VLC and other packages! Thank you very much Eric! As always, your many contributions to Slackware are greatly appreciated! In more, thank you very much. npapi-vlc: as well as DVDs, VCDs, and various streaming protocols. … how difficult was that. I will be more careful in the comments. it’s ironic that a german research organisation is using the us patent system. thanks eric for the good work. I couldn’t hear the sound while playback, and my web browser(Firefox) also no sound in Youtube even i had set the volume to high? but i have sound with XMMS, only not in firefox,konqueror and seamonkey when i play youtube. When I open a Youtube URL, the video gets played in an embedded HTML5 video element (apparently this is being chosen automatically because of my use of Firefox). Sound plays OK here, it does not use VLC. Usually you would get an embedded Flash player, and that too, does not need VLC at all. What happens if you open the Youtube URL directly using “Media > Open Network Stream” in VLC? Sorry if there are more than one similar previous comments. I thought it didn’t Submit after i click the Submit tab, it didn’t show up my comment. I was excited to try out your newest VLC because the developers have been focused on improved ogg playback and I have been watching a lot of ogg videos lately. However, it seems that most of my files play with the same quality as with previous 2.0.x releases, but the ogg videos look much worse! Everything looks choppier, like the framerate is lower than it should be, and talking people look out of sync with their words. Do you have any suggestions as to how I might fix this? Or is there a place your old packages are stored so I can revert to the old version? On the machine in question I am on Slackware64-13.37. I have no idea how I should troubleshoot that. My package is using the same libtheora-1.1.1 as the VLC developers do, and I am linking dynamically to Slackware’s vorbis library. I am not a VLC developer myself so I can not comment on the player function-wise. I think perhaps you should open a thread on the VLC discussion forum. My old packages can no longer be downloaded. I’ll send the message along to the developers. Fortunately, I didn’t get around to upgrading my Slackware64-14 machine yet, so I still have that player working. I see, for that i got both installed. After few trial and error it is OK now,I think it is due to the audio output device setting. If I open a dvd movie with vlc, it plays the movie (plus all the ads, coming attractions, etc…) but the sound is nothing but static. If I rip a title using handbrakecli to an mp4, it plays that title and the sound is just fine. However, if I re-author the mp4 to dvd, sound again is nothing but static. MPlayer does fine with either. Is there something simple I’m missing? No idea Mike… I would have to find a DVD and try it out.